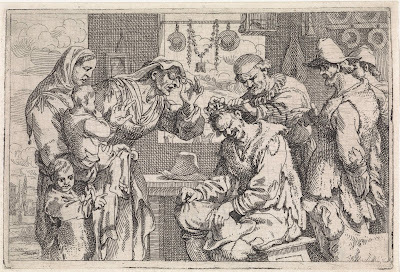 This first prompt for the 2019 challenge is about the first ancestor I 'met' - Lodewijk Knoops. His portrait hung on the wall in my grandparents living room beside the grand writing desk. I was about nine years old when I first enquired who that man was. He's family, I was told. It was a classic oil painted portrait, with a gold painted frame and a little larger than an A4 notebook in size. It shows Lodewijk Knoops, seated at his desk with quill in hand, poised as if about to write something important with three very large heavy books stacked by his elbow. Behind him we can see a large well stocked book case. He is wearing the typical 18th century male attire for the middle class; the frilly lace cuffs at the wrists, a patterned waist coat, the long coat in a dark neutral colour and the powdered wig. He was a slim man probably not very tall, unsmiling, but with regular features, pale complexion, small mouth, thin lips, straight nose, brown eyes, not unattractive. Death is one of the certainties of life. Let's explore causes of death this week. Do you have a relative who died in an unusual way? Perhaps you've found an unusual record that shows the cause of death. Finding the cause of death is a challange. 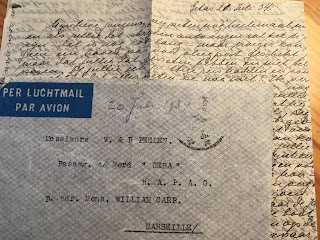 The Dutch BMD records simply state the date and name, plus some biographical details such as place of birth, age and the parents. But then I discovered that Amsterdam kept statistics for the cause of death between 1811-1868, Staten van overlijden naar geslacht, burgerlijke staat, leeftijd en maand van overlijden. (Statistics for deaths according to gender, civil state, age and month of death). Here I found the reason that Cornelia Blomberg, my grandfather's sister, died at the tender age of six. It took me some time to browse through the online scans, but I knew the address of the family at the time, which did not yet include my grandfather (he was a born in 1991) and the date of her death - 29 November 1890. 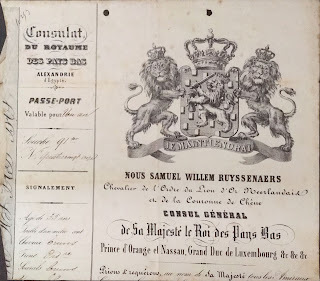 For the week 38 prompt I have chosen Jan Peelen's passport issued to him when he left Egypt in 1861 with his family. I have already written about my 3x great grandfather's time in Egypt in a previous post and this continues the story. It is all in French, though the passport is issued by the Netherlands. I don't really know why, but it seems that French was an official language at the time. I've noticed French in other Dutch official records of that period. So in the left column we can see that the passport is valid for a year and it was issued in Alexandria, Egypt. Then we get a description of Jan Peelen - signalement. He was 35 years old, had brown hair, brown eyebrows, blue eyes, ordinary nose and forehead, round chin, brown beard, medium mouth, oval face and a clear complexion. No special characteristics were noted either. His profession was given as Civil Engineer. This week's prompt is to write about a a relative who most closely matches my birthdate. My two direct ancestors Jan Blomberg and Reinier Scherius are my closest relatives who match my birthdate, followed by my great great uncle, Gerrit Nicolaas Bronke and another great great uncle, Cornelis Wit. The one I've not written about or researched before is Cornelis Wit, brother of my great great grandmother Aafje Bronke-Wit, so he is the choice for this post. Except, in the family tree handed down to me, his birthdate is shown as 13th June! So what is the story here? His geboorte akte shows 12th June is indeed his birthdate, but the record is dated 13th June. Work is the theme for week 36. Examining your ancestor's occupation is a great way to build context. Do you have an ancestor with an "unusual" occupation? Have you found records relating to any of your ancestors' lines of work? Do you have photos of them at work? 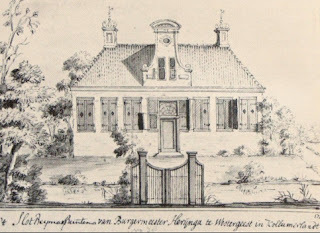 For this post I am highlighting my direct ancestor, Gerrit Lourenszn Wit. 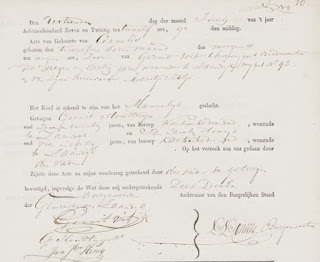 He was probably born late 1787, judging by his christening date of 10 February 1788, in the Beemster, Noord Holland, The Netherlands, as son of Lourens Gerritszn Wit and Jannetje Cornelisdr Kroon. I wrote earlier this year about Lourens Gerritszn Wit in a post for week 18 - Close Up and the confusion around his name.